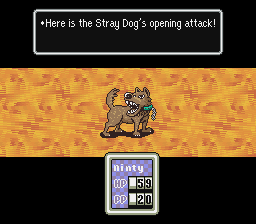 Ever since I finished working on the MOTHER 3 fan translation, people have been asking what’s up with my old EarthBound Zero remake hack project. I probably should’ve made this post a good while ago, but I only remembered now after playing the hack on my Wii the other day and being surprised by stuff I had forgotten about in it. 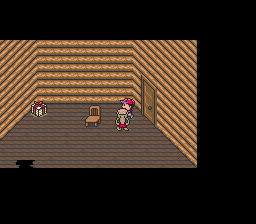 If you’re not sure what this EarthBound Zero remake hack is, basically back in early 2007 I decided to start hacking the EarthBound ROM to try to recreate EarthBound Zero. A lot of people have a hard time getting into EarthBound Zero, and this hack addresses many of those issues. 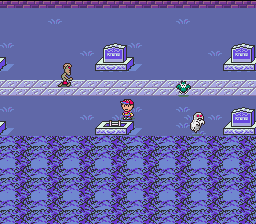 No more insane random encounter rate – you can see the enemies walking around just like in EarthBound. Better-flowing text, more colors, better presentation, the list goes on. Anyway, if you’re interested, read on to see a quick history of the project, pics, a link to the latest version patch I have, a quick rundown of what you can do in the early beta build, some MP3 links, and other stuff! One of the biggest mistakes that many fan game creators make is starting by making the game’s content first and continually making up new content as they go along. This almost always ends with the game getting nowhere. I know this from personal experience – so many of the games I made growing up went nowhere because I did things wrong. 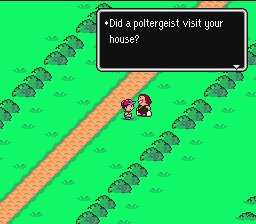 Another problem with fan hacks, especially with EarthBound, is that the tools available only really let you edit existing stuff in the games. What I wanted was to start with a clean slate. So I wrote a program to clear out all the map data, text data, NPC data, etc. 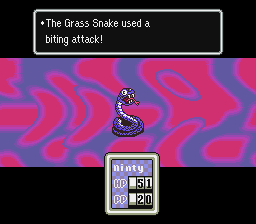 Another thing that’s really bad about EarthBound hacking is that the text system is absolute craziness. So I wrote a custom program that made things a lot easier and gave me much more control now that the game was cleared out. It’s now easy to place NPCs anywhere in the game and assign them text and events and have complex scripts take place. 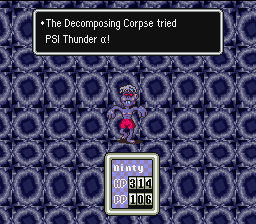 With that in place, I pulled the text from the EB0 ROM and converted it into a format for EarthBound to handle. I turned off most of the lines after seeing that this worked, and the plan was that I would come back later and edit the text to be a little less bland, while also assigning NPC data to each line and placing the NPCs in the appropriate locations. I quickly gave the enemies their new names, but giving them all their proper actions would have to come another day, as that’s a ton of work in itself. After doing lots of tool testing and adding new capabilities to the tools as needed, I started to put together a small testing area in the game. 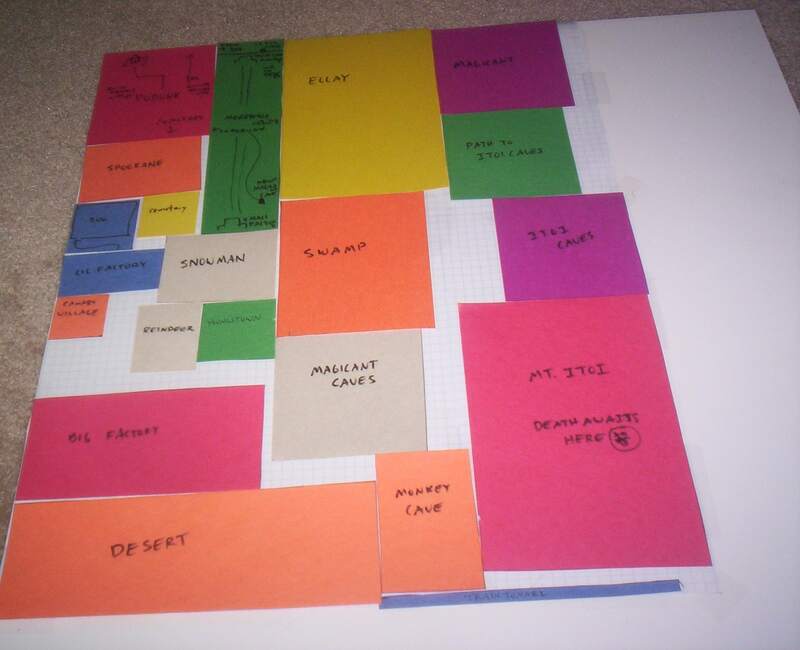 After that, I started putting the basic map layouts together, basically segmenting which area will be which map. 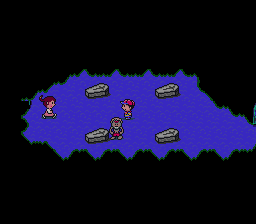 I should mention that maps in EarthBound are actually technically just one giant map. This giant map’s size is 8192×10240 pixels. 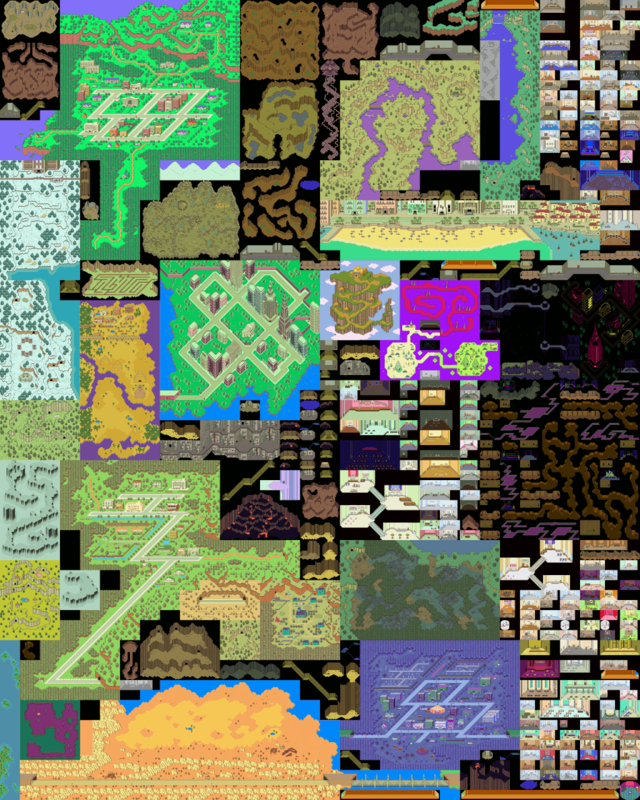 EarthBound Zero’s map, though, is 16384×14336 pixels. So the maps in the remake hack would have to be squished down, and the free-roaming aspect would have to be taken out due to other technical reasons. 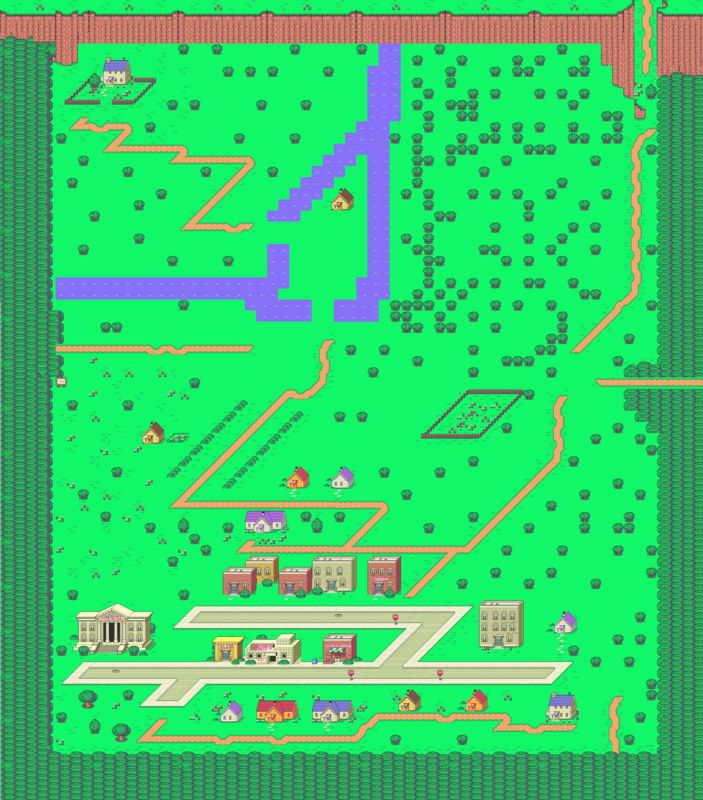 Anyway, I implemented the basic map layout design and started on some early maps of Podunk. You can see how squished things had to be from a very early version of Podunk compared to the actual EB0 version of Podunk. I also made a quick graveyard area as a test and connected the two maps. Besides the map editor (which is quite complicated, it’s also a tile editor, a mini-tile editor, a property editor, and many other crazy things), I’d probably need to get the help of a really skilled map editing person to create new minitiles with which we can create new custom tiles. The technical limits are pretty strict though, and I imagine just making the tiles themselves would take many months. This is one aspect where I envy RPG Maker enthusiasts. 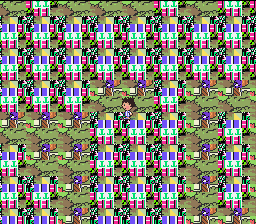 Editing maps in EarthBound is hell and creating entirely new maps in EarthBound is super hell. While all this was going on, helpful folks on the PK Hack boards offered things like custom overworld sprites, and lewahi even did some early music editing. 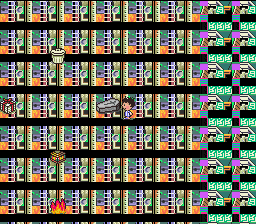 Editing music in EarthBound is also hellish, so that was impressive. All of this took place in just a few weeks’ time in 2007. I started to document things here, but then the map problem showed up. Looking back, for the amount of time spent, a whole lot actually got done. It’s a shame progress had to stop there. Download the EarthBound patching program – use this, NOT a standard IPS patcher! Run the patcher program. Select the ROM and then select the patch, then press the button to patch the game. At the naming screen, some of this stuff has already been changed. The biggest thing of note is that Pippi is going to take King’s place, so when it asks you what the pet’s name is, you should probably name her Pippi instead of Doggy. It doesn’t really matter though. After this, the game will do its usual flyover intro stuff, but with weird maps and weird music changes going on. Ignore that for now, that’s the kind of stuff that would be changed near the end of the project when putting everything together. Anyway, you’ll eventually see a bright green area. You can walk around and stuff, but just wait a few seconds. The screen will shake and then you’ll be free to do whatever you want from then on. This is the first area I made, it’s a little debug area where I tested my tools, scripts, and other things. Some of the objects will give you items. The cat changes the palette. 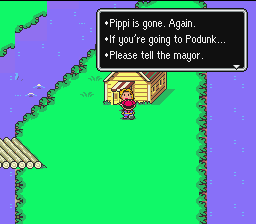 Talking to the Mr. Saturn will send you to Podunk. But before talking to him, you can check out stuff to the north. 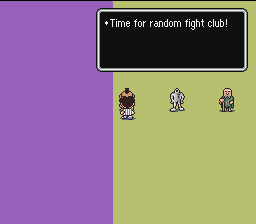 The Mr. T guy will initiate Random Fight Club, in which you basically fight a random enemy. Almost all enemies have 1 HP for testing purposes. The Starman guy will make you fight the Starman Prototyper. He’s tough and can kill you if you don’t raise your level beforehand. I forget why he was there. If you die, you might get stuck and have to reset the game. The Star Master will let you change your level. The slot machine will give you any item you want. The jukebox will let you hear any song in the game. Just know that if you walk too far away, the music will reset to the proper music for the area. So if you want to listen to a song, you shouldn’t walk around and go anywhere, it’s the way the game’s engine works. 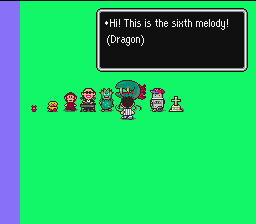 Even further north you can check out an early version of all the eight melodies you get in the game. They use existing EarthBound instruments, so if they sound weird, that’s why. 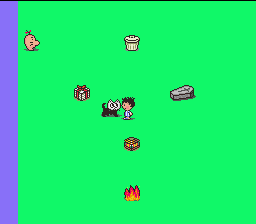 Talk to the Mr. Saturn and he’ll set up some event flags and send you to your home in Podunk. You can go into your house and talk to your mom, your sisters, and use the phone. I was testing stuff out here, so the sisters will get you into some fights. One of the latest things I had created was the “Debugalizer”, which is a really useful tool for debugging and checking stuff. With it, you can do all kinds of stuff and warp to any area of the game. I also tested out my tools a bit by having a few of the Podunk NPCs show up. For the most part, they say exactly what they say in EarthBound Zero. Text editing would come much later. By the way, southwest of Pippi’s house is the entrance to Canary Village. There’s nothing there right now, but a different, sadder song plays there currently. Far north of Podunk is a wild area with lots of trees and a gift box. Further north of that is where the zoo would be. You can go east from the Zoo to eventually wind up where the cave to Magicant would be. East of Podunk is the entrance to Merrysville, which also has a new song, which is my favorite out of all the new music. Keep in mind that the map layouts were all super-basic and would be made MUCH better later on. Even Podunk’s current layout is temporary and mostly for testing. Talk to the mayor, and he’ll set an event flag. Southeast of town, you’ll run into some zombies. You can talk to one of them and fight him, though he doesn’t disappear afterward at the moment. 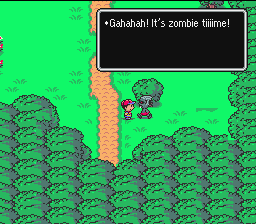 If you’ve played EarthBound Zero, you might remember that some of the townspeople are actually zombies in disguise and will attack you if you talk to them. He’s like an early version of that that I was testing. If you talked to the mayor, then one of the graves in the south area of the cemetery will be open and you can climb down it. Inside, you’ll find four coffins and the missing Pippi. I know that in the original game she’s IN one of the coffins, but that would require a ton of work and this was for quick fun and testing purposes. Anyway, talk to her and she’ll join you and give you the Franklin Badge. Head back out… but wait, there’s a zombie boss in the way! If you’re at the right level, then he should be pretty hard, but since he uses PSI Thunder, it’ll bounce off your badge and kill him. Afterward, Pippi will say something and then you can go. Here, I was testing more complex scripting. That’s as far as the mini-demo goes. You can’t even leave the cemetery it looks like, I remember that the map editors were giving me trouble connecting the cemetery to Podunk. There are still a few more things you can do if you want though. Use the Debugalizer to warp to anywhere in the game. Most maps are still early placeholders, but in Magicant I left some of EB0’s script accessible, mostly just the end credit names though. You might also want to try the Mt. 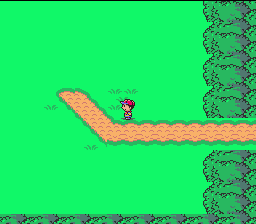 Itoi Trail, which is a quick maze I made. It’s kind of fun, and I even managed to get myself lost in the maze two years later. The cave at the end of the maze doesn’t work, but the gift box was meant to be a goofy “hurray you made it to the end” thing. Not all of the items have descriptions yet, but those that do are kind of neat. I also added a number of different items, so you can look through those if you want, using the Debugalizer or the slot machine in the debug area. Like I mentioned before, this is more of a project that gives me fun rather than something I want to get done right away. It could take me 50 years to finish for all I know. Or I could never finish it, who knows. It’s just fun to work on (except for the damn maps) so I’m going to keep having fun tinkering with it. That said, I probably won’t be able to do any more work on it for a while, especially without a decent map editor. If I wind up having to make one myself, it’ll be quite a while longer. 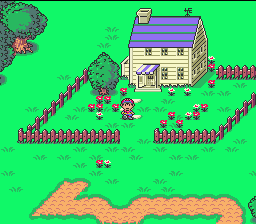 In the meantime, there are RPG Maker projects and such which attempt to recreate EarthBound Zero with better graphics and all that, so look around for those if you’re hungering for a remake of the game. 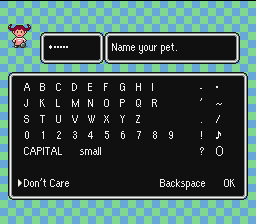 My translation of MOTHER 1+2 might also satisfy that need, if I go through with the super-colorization thing, but that’s another thing altogether. I probably won’t have any updates to make until I do continue work on this, so if you don’t hear anything for a long while, that’s why. But you can check out the beta patch above, the simple progress log from days of yore, and some of the early development videos. Also, if you’re curious, check out the to-do list. Until another time, in another space! Wow! This looks great Mato! It’s too bad about the maps thing, though. 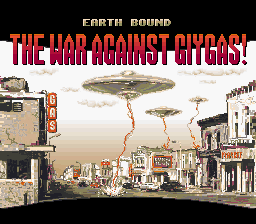 I havn’t played EarthBound Zero, but I might try this! This looks cool! The Bein’ Friends song sounds like it could have been in the actual game. I just finished the demo. It was awesome! I didn’t really want to us the debugalizer though, because I didn’t want to spoil anymore of EB0. This is great! My only complaint is Pippi is a tad screwed up, but other than that, it was awesome! 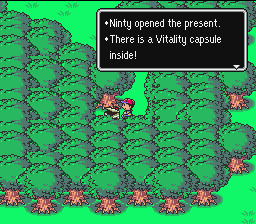 What level does Ninten learn his ”special” PSI at? Is it even in the demo? Because I know that my ”special” was PK Hack, and I got to level 8, the level where Ness learns it, and I didn’t learn it. 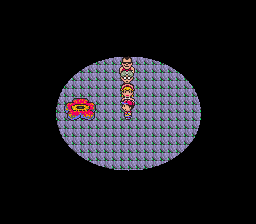 Also, I absolutly ADORE Ninten’s sprites. They are so perfect. I love how they make him seem younger, without him seeming too young. I also like the name you put as default, considering you can only have five letter names. 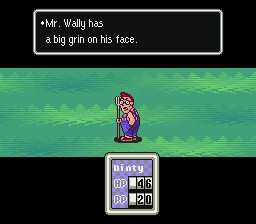 Heh heh, Ninty. This is an excellant job, Mato! I hope this is finished one day! Looks Great! Hope you are able to get past that mapping problem sometime! the music also sounds great! Ninten doesn’t have any offensive PSI. I know, but why would you have to put in favorite thing, then? Or did Mato just not get to taking it out? Not a big fan of the music but good job! Amazing. 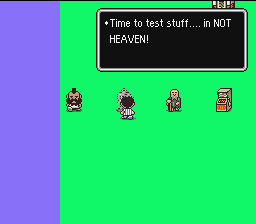 I enjoyed EarthBound Zero when I used the easy type patch, so a remake would be very interesting to me. Mato, I love the work you’ve done with the music. You can tell there’s a lot of work put into it. Its too bad things arent going well map-wise, but I hope all will be resolved soon! What exactly was the problem you were having with the maps? If it was just the extra tiles you’d added not appearing correctly, the solution is to add more tiles. One tile at the end of the tileset should do the trick. I had very similar problems with Operation: Rescue Venus, back when that was a viability. P.S. Devaux: Iewahi did the music editing. Wow, it looks amazing, great work. 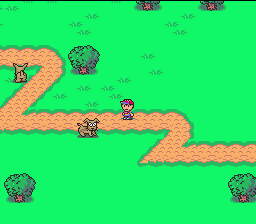 If you could find a way to implement sprinting from the beginning ala Mother 3 I would seriously love you forever! 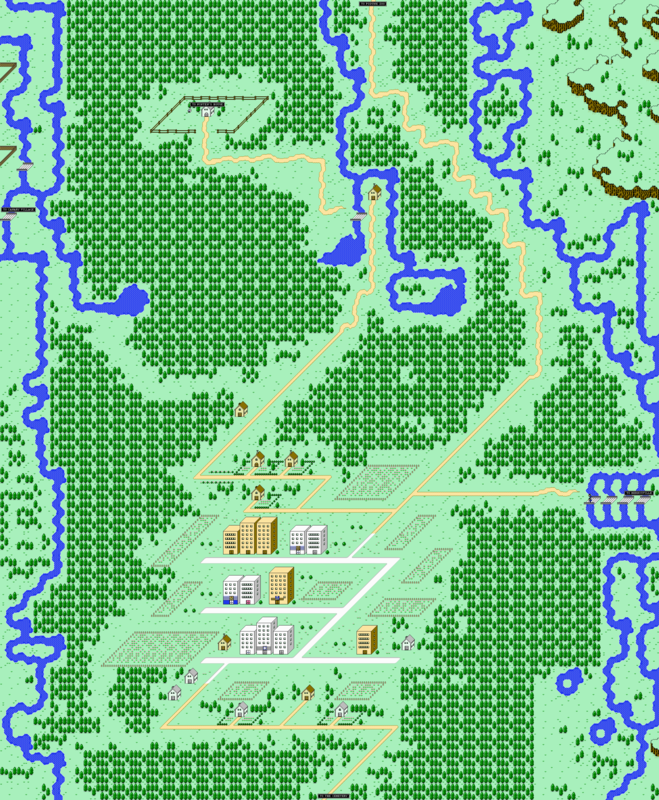 The thing you meant with “drawing a map by hand, then cutting it up in tiles and micro-tiles”, did you mean that because the game only uses one tile layer, the tiles and micro-tiles had to be drawn as to fit to one specific scene in the whole game, so that there’s numerous versions of the same hedge, but sometimes, it hides part of another hedge, sometimes it obscures part of a house, …? You need to master using it before you can get it. do you care if someone tries to finish the maps? cause my cousin is thinking in try to make merrysville and snowman. 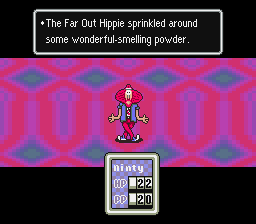 but when you have a hippie sprinkling wonderful smelling powder to help you make a hack, its a breeze! Wait, is Ninten really supposed to have a scarf/bandana? Or do some people just see him like that because of the commercial? I don’t really have any skills in game design or anything, but if there’s any way I can help, I will. I know there are things that can convert music to 8 or 16- bit era music, though i’ve never used them myself…. Tile desgin looks nitpicky. Maybe you need to have a specific area where you want the tiles? you know, like a paint filler tool works on drawing programs. I like how the music was changed to sound more EarthBoundy. Ninten looks like a prescholar, plus Pippi looks older than him. :/ But if you’re trying to seperate the size from kids to adults I uderstand, I wonder how small the youngtown kids are. Where can i get an earthbound 0 rom that the pather can upload? Try coolROM or Rom Hustler. Is this game is going to be on the Nintendo DS system? Is there a place where I could find the updated EB0 sprites? Since this doesn’t seem to be making progress, and I like those sprites. reminds me of when I was editing music on NES games with a hexeditor. talk about HARD!! good thing I learned to work with assembly, sure anything and everything is possible with hex, if you know what you’re doing. but… why dig a hole with a spoon when you got a shovel. I don’t know what to say other than this is amazing!!! I really hope you try to go somewhere with this, Mato. If you ever finished it….I think it would make you even more famous than you already are. 😉 But seriously, these graphics are just INCREDIBLE. 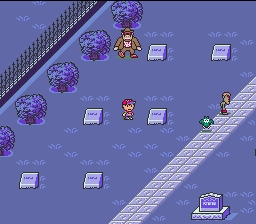 They’re so complex, yet so simple…they almost look better than Earthbound’s graphics! I did all the steps but when I try to run it on SNES9X, it says that there’s an error. Music Major here, interested in giving assistance in reworking the music. Is there any chance you’re interested? I tried accessing the videos, but your YouTube account’s been terminated for what sounds like a rather bullcrappish reason… ._. I’ve worked on this a little (of course I’m not Mato, but I was extremely bored one day), and I’ve changed around some stuff, like the default names for stuff. The original default names were: Ninty, Ana, Loid, Teddy, Steak, Stuff. The new ones I put in are: Ken (Ninty is #2), Ana (Anna is #2), Lloyd (Loid is #2), Teddy, Prime Rib, Dynamo. Whazzat? You say Prime Rib is too long? It is and it isn’t. I will tell you how I got that to work that in time, my friends. When I get a lot of work done, I may post a topic about it and include a link to download the current patch and/or a video. Mato, I’m not wanting to take this project from you. Like I said, I was just bored one day and decided to work on it. Nice music.Makes me wanna play the original EB0. I have my out in this one! 😉 Bein Friends actually sounds like it would be an an actuall EarthBound game. Is the sad Pollyanna song supposed to be tombstone? @Rockin’Ness. Oh and Ninten doesn’t know any offensive PSI. I do indeed hope that Mato at leasts gives him the power of PK Beam. I doubt this will happen but it might be possible to get PsiPaula 4’s premission to let Ninten us PK Techno. Mato quick question, will you be using a lot of the EarthBound music in the hack. For instance, Paula’s theme comes from Youngtown and are very similar. Will you be putting in new music or keeping it the same as EarthBuund? Or using appropriate music like Monkey Caves? I’m not actively working on this project, but some other fans have started their own “fork” of it. You’ll want to ask them rather than me – you can find them on the PK Hack board of the Starmen.Net forums. @Mato okay, I will. But will you ever be active in this project soon? I doubt it, I don’t have enough free time per day to commit to a new project. Wow… last commentary was in 2011. Stream of time is so fast… I guess that project will be not finished. Too much time has passed. 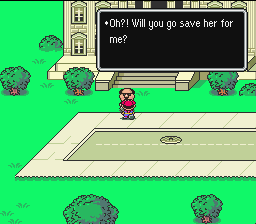 What a pity, i always wanted more colors for EarthBound Zero/Mother. 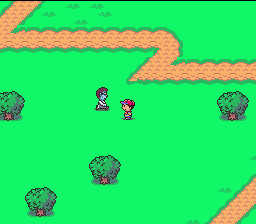 It was such a nice idea to make ErathBound hack like EarthBound Zero. Correct me if my opinion is wrong… maybe i just tired to wait? 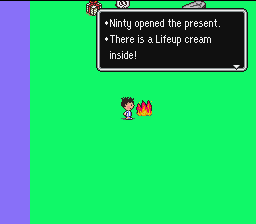 by the way… Thanks, really, for translation of EarthBound 2. Without traslition was impossible to feel that game, to dive into into it, to understand the essence of all the dialogues. use the power of PK hack. however, its power is too much for the title screen to handle. DO NOT EDIT A SINGLE SMUDGE OF THE TITLE WITH PK HACK. 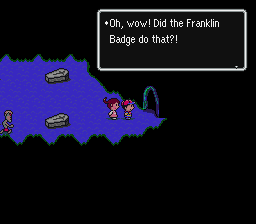 unless your rom has a franklin badge. 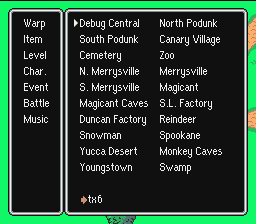 anyway, PK hack has a text editor, it also has a basic text editor that you can use to change the naming screen stuff. PK hack has everything, and some pre-made IPS patches. the title screen patch works, and so does everything else, maybe. i only tested a few. they arnt big ones, just tiny tidbits [like changing the nighttime at the start of earthbound to day] and other stuff. theres even the worlds simplest sprite editor. somehow my ZSNES emulator won’t go beyond the startup questions. does anyone know ow to fix this? Sorry to comment again, but is earthbound zero without any hacks or alterations any good? I mean enjoyable to play good? The storyline is great and the bosses and battles are good but the graphics when you’re moving around might be a bit too old school for me sadly… Is it worth it? Reason, is your OS. Rom-patching isn’t working, or working wrong with: Windows Vista, Windows Seven, Windows Eight. Maybe some old version OS like Windows XP, steel grant to you ability to patch (correctly) SNES Roms. And PLEASE don’t post more OFFTOP here. Have a nice day. If there’s a way to patch it on android, I would greatly appreciate it. when I patch this it becomes a black screen, nothing more. any help?